8x10 glass negative photographed by James Burton on September 3, 1903 at New York Bay off New York. Image of the American defender RELIANCE, in the foreground, racing against the British challenger SHAMROCK III, in the lead in the background to the right at the start of the third America's Cup race, undersail, starboard beam view. SHAMROCK III was a 134' cutter designed by Watson and Fife, Jr. and built by Denny & Brothers of Dumbarton at Levin, Scotland in 1903. 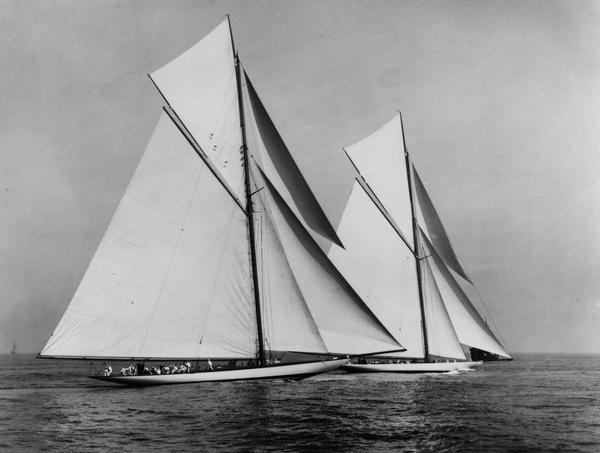 RELIANCE, was a 143' cutter designed by Nathanael G. Herreshoff and built by Herreshoff Mfg. of Bristol, Rhode Island in 1903. Negative sleeve handwritten info. : "B-939 / America's Cup Race / Sept 3 - 19-0 / Start". Info. handwritten on negative margins: "16 / 939 / The start Sep 3rd / 1903 Start / copyright Cup Race Sep. 3 '03". CREDIT LINE: Mystic Seaport, Rosenfeld Collection, James Burton photographer.